Bullying: 7 Ways to End it Now! Bullying gets so much press these days. That’s a good thing! To shine the light on the darker aspects of our human experience like bullying helps us to create positive shifts both individually and collectively. Bullying is an esteem issue. Bullying is about being convinced that ‘for me to feel good, I must make you feel bad.’ Bullying isn’t only inflicted through physical abuse and violence. There are more subtle, less obvious versions of bullying like verbal abuse, mind control, manipulation and distortion of the truth. Bullies always target someone who, like them, doesn’t have healthy self-esteem. So, why do people become bullies? As I said, bullying is a symptom of low self-esteem created by one or all of the following life challenges: 1. lack of trust in role models like parents, 2. the need to be in control because life feels out-of-control, 3. the need for attention, approval and love, 4. deep anger issues, 5. always feeling ‘wrong,’ 6. being bullied physically and/or verbally themselves and 7. being emotionally abandoned as a child. Bullying requires two parties, each of whom does not feel good about him or herself. It’s not only in the school yard. In fact, it’s likely to start in the home between husbands and wives, parents and children and between siblings. The dysfunctional behavior that bullying represents is the result of most challenges people face world-wide in today’s societies. When we each have a healthy sense of ourselves…in other words, a healthy self-esteem, most of life’s so-called ‘problems’ seemingly disappear. No matter where you are in life: young/old, male/female, and no matter what roles you play: husband/wife, parent/child, boss/employee, friend, classmate, the most important step is to feel good about yourself. When you and I take responsibility for feeling good about ourselves and share with others how to feel good, too, bullying will become a behavior of the past. Chris and I have developed what we feel are 7 approaches that can assist you to begin to eliminate being bullied or the role of being a bully from your life and the lives of those you cherish and love. 1. Become aware about how you feel about yourself. Be honest! Not feeling good about yourself is just based on a negative story you’ve been telling yourself over and over. Is the story absolutely true about you? I doubt it! 2. Identify your fears. This pertains to both you the bully and you the victim. For example: perhaps as a child, your parents divorced. You couldn’t control that, so to create a level of safety and security, you unconsciously decided to bully others because it gave you a sense of control, power and security. 3. Create small ‘successes’ in your life that will make you feel more confident thus building your self-esteem. This is essential not only for children, but for adults, too! And especially for you adults reading this blog who have children: assist your children by supporting their likes and passions. Let them explore life on their own terms. Otherwise, you’re bullying. 4. Choose to be around positive people. Hang out with people who lift you up and don’t put you down. Examine your circle of friends. The company you keep is very telling about how you feel about yourself. 5. Mentor or coach with someone who can assist you to go through the process of raising your self-esteem. 6. Have the courage to set boundaries. 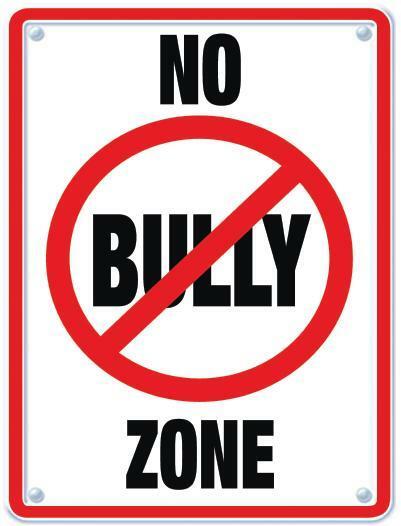 Bullying is all about ignoring boundaries and disrespecting others. Know that real boundaries between you and others can only exist when there is mutual respect. 7. Celebrate your uniqueness and the uniqueness of those you love. People who tend to be bullied are perceived to be different in some way. They may be quiet, shy, non-athletic or non-academic. It’s important to understand that it’s part of who they are. By committing to these seven suggestions, you can begin to develop a healthy self-esteem and assist others to do the same. It doesn’t matter your role, be it the bully, the bullied or even both. When we feel good about ourselves, bullying will dissipate and perhaps diminish in our world as we know it. You and I both have the power within us to change. It is that power to feel good about ourselves that will end bullying. We can do it!